Witty and insightful, these essays from the Pleiadian Renegades’ set a new standard in bringing humanity into closer contact with our stellar kin. 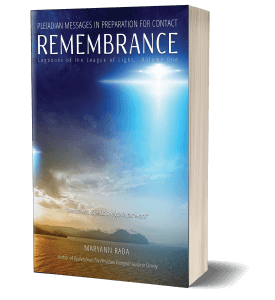 Remembrance: Pleiadian Messages in Preparation for Contact gathers messages to awaken and enlighten human consciousness to the very real potential of meeting humans from interstellar civilizations and realizing our place among them. Look into the future, and you will discover your past. Chapter 9/ When Will the Condolences End about the Death of Nemesis? “Remember! Speaks straight to the heart!” —E.